Use these free workbench plans to build yourself a workbench in your garage or shed that you can use to complete all your projects and maybe even get yourself some extra storage, depending on which plan you choose. The free workbench plans below vary in skill level, the cost of supplies, and the time it will take you to complete them. Visit each link for the detailed instructions on the requirements that each workbench will need. 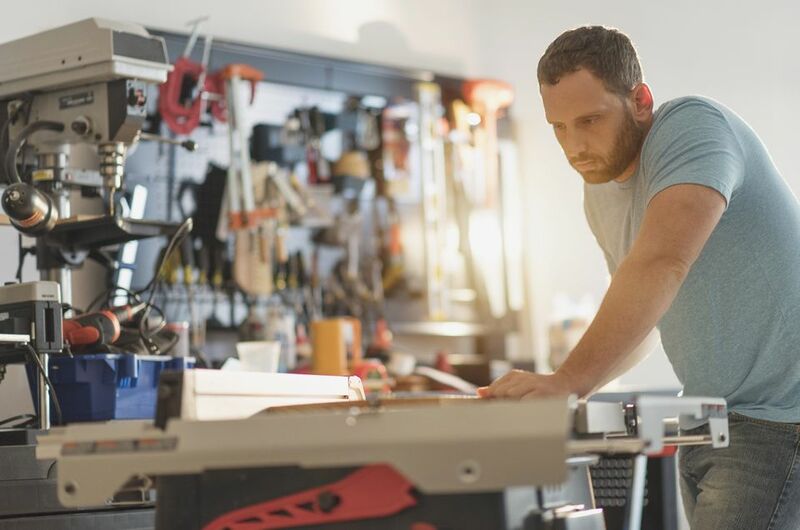 You'll want to choose the workbench plan you're going to use carefully, taking note of the space you have in your area as well as what you need to use the workbench for. After you've used a workbench plan to build your new workbench, you can use it to build a dog house, bookcase, or picnic table and then move onto a bigger building project like a router table, deck, pergola, gazebo, chicken coop, bench, or other free woodworking plans. 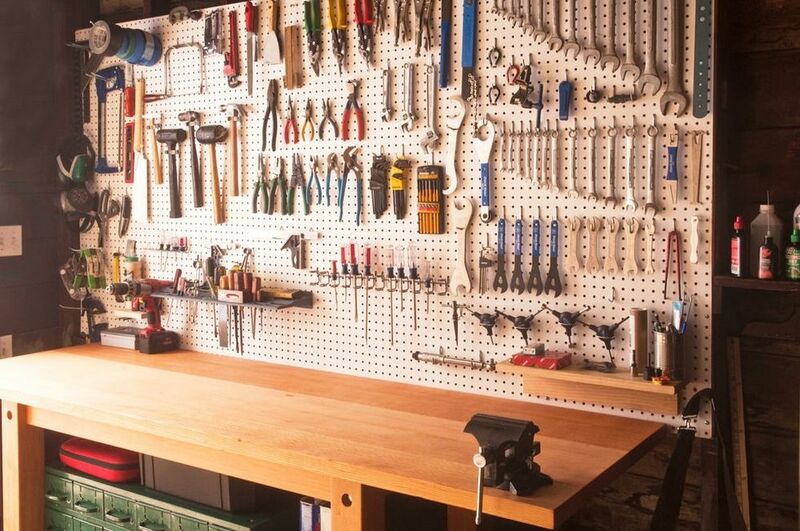 It will take you just one weekend to build this ultimate workbench plan. It has a large top, uses common lumber dimensions, and is built to last a lifetime. This free downloadable workbench plan includes a materials list, cut list, diagrams, color photos, and lots of tips along the way. Here's a free workbench plan that will build you a simple but sturdy workbench in just one day. The workbench includes a bottom shelf and drawers for storage. Included in the free workbench plan is a blueprint, step-by-step building instructions, a list of tools and materials needed, as well as user comments. If you're looking for a simple and sturdy workbench that's still mobile, this is the plan for you. The plan has step-by-step written instructions, a tools list, a materials list, a cut list, color photos, and extra tips. The Family Handyman has another free workbench plan for you, and this one is perfect for the garage. The finished workbench includes drawers and a shelf as well as a top that folds out for extra workspace. You'll be able to complete your workbench in one day with help from the workbench sketch, instructions, and tools and materials list. If you're short on time and money then this simple workbench plan may be just what you're looking for. This workbench takes no time to build but has plenty of room for all your tools and ample space for your woodworking projects. Use the tools and materials list to gather everything you need and then step through the instructions and blueprint to build this simple workbench in an afternoon. Here's a nice workbench plan from Popular Mechanics that will build you a sturdy, traditional workbench. A list of tools and materials needed and step-by-step instructions are included. You can also download the PDF file that includes the workbench plan as well as animated assembly instructions. Build your own DIY workbench with this free plan from Shanty 2 Chic. It has a large worktop and bottom shelf and is on wheels so you can take it wherever it needs to go. There are color photos, a supply list, and complete directions so you can build it yourself. This simple workbench plan from Fine Woodworking requires only a circular saw and drill along with easy-to-find materials from your local lumberyard. This workbench plan includes a supplies list, blueprint, and even an instructional video. Here's a free plan for an adorable kids workbench that is complete with a worktop, bottom shelf, and pegboard. Even though this is meant for kids, you could certainly raise the counter level and it would be great for adult use in a small space. The free plan includes a tool list, materials and supply list, diagrams, color photos, and step-by-step building instructions. You'll find everything you need to build this sturdy workbench including a blueprint, cut list, materials list, and instructions. Browse through the user-submitted photos of the finished workbench to see how it turned out for others and any additions and notes they had to the plan. Carry out this workbench plan and you'll get a simple but sturdy table that costs less than $100 to build in just a few hours. Use the user comments, videos, material list, and instructions to build this simple workbench. This workbench plan is perfect if you are small on space. It includes a fold-out work table, a roll-out table saw stand, a metier box table, drawers, shelves, cabinets, and pegboard. Use the step-by-step instructions, tools and materials list, as well as the user comments to finish this modular small space workbench. This sturdy workbench plan includes 48 pages of detailed instructions, illustrations, photos, and more. Your finished workbench will be a mobile workbench with a large worktop, drawers, and cabinets. This workbench plan will show you how to build a folding workbench that's on wheels so it can be moved quickly and easily. This is a moderate level workbench plan that will take you one day and $100-$500 to complete. DIY Network has a free workbench plan that remains attached to the wall and features a fold-up table so you can tuck it away when not in use. It will take you two hours to build this workbench and cost of materials is under $50. You'll find everything you need in this workbench plan including a list of materials and tools as well as step-by-step building instructions. If you're looking for a quick workbench plan that won't cost you much money then this is a great project for you. This sturdy workbench will only cost you $20 to build! Detailed instructions, a material list, and lots of pictures will make this workbench plan easy to carry out. This free workbench plan from Wood Magazine is for building a workbench that also serves as an outfeed table for a table saw. Download the PDF of the workbench plan and use the instructions to build this sturdy and functional workbench.